I have always loved you. They are the words we want to know in our bones, on our bad days, in the moments we wake up during the thick of night. And yet we, like Israel, can find it hard believe. “Really? 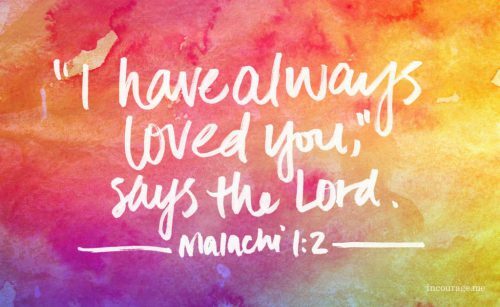 How have you loved us?” (Malachi 1:2). God answers with what He has done, how He has shown His faithfulness, the ways He has fulfilled His promises. He talks about Jacob and Esau, the hill country and a desert for jackals. I wonder if they scratched their heads then. Because they, like we often do, might have different ideas about what “love” looks like. God, if You loved me I wouldn’t have this struggle, that heartache or the salty tears on my pillow. God, if You loved me I would be married/have a baby/live in a Caribbean beach house. God, if You loved me I would be rich and successful and never have bad hair days. Surely life would look like what we long for if God really loved us. When that doesn’t happen we get scared or controlling, impatient or bitter. We go looking for love in other places, other faces. Maybe we decide we must be unworthy of being loved by God. We will try harder. We will do better. All the while God is saying, I have always loved you. Here is the evidence: My Son on a cross, My presence in Your life, My Spirit within you bringing truth and grace. My love is wound through your history like a scarlet thread even in the dark moments. It is the one constant in the chaos. It cannot be lost. It cannot be won. It is yours in the blink of this life and the vastness of eternity.